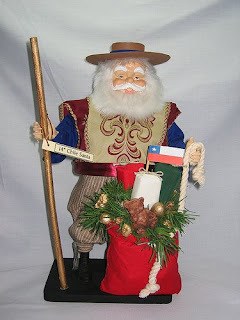 In Chile, Santa Claus is called Viejo Pascuero, or Old Man Christmas. In some areas, he strongly resembles Santa Claus in a red and white outfit and comes in a reindeer-drawn sleigh. However, he climbs in windows since chimneys aren't large in this warm climte. In other areas, Viejo Pascuero is seen as a local rancher and is often in the company of a llama. December and Christmas also fall in the summer months in Chile, so children are out of school and the weather is warm. The midnight mass on Xmas Eve is where most of the people and families go. Afterwards, the families celebrate Holiday Dinner together. This meal often includes azuela de ave, a chicken soup filled with potatoes, onions and corn on the cob and pan de pasqua, a Christmas bread filled with candied fruit similar to fruit cake. Afterwards, the gifts are unwrapped and everyone stays up till the wee hours of the morning.